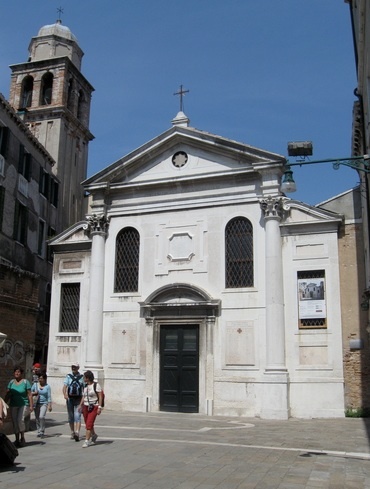 This corner of Venice boasts two churches dedicated to St Simeon: this one, also known as the 'Grande' is smaller than San Simeone Piccolo, as the latter was rebuilt in the 18th century. But the names have stuck. San Simeone Grande, last rebuilt in the early 1700s by Domenico Margutti, has a simple Greek temple attributed to Giorgio Massari. Famous paintings in this bright and cosy church include The Presentation in the Temple with Donors by Palma Giovane over the altar and a badly restored Last Supper by Tintoretto near the door, a typically startling composition, with the Apostles all the complete Renaissance gentlemen, and the table set at an angle to the viewer. Even better is the 14th-century Effigy of San Simeone by an obscure artist named Marco Romano, laid out in full rigor mortis in the chapel to the left of the altar; if it’s very quiet, they say, you can hear his death rattle. Perhaps it helps if you think hard about the thousands of victims of the 1630 plague buried beneath your feet under the church floor (there are actually two intact floors, ordered after the plague by the Department of Sanitation) or remember that San Simeone Profeta was once the parish church of a pork butcher called Biasio, the original Sweeney Todd. Biasio would stuff his celebrated squazzeto alla Boechera with the flesh of little boys, an adventure in commercial cannibalism that makes old-school Venetians shudder every time they walk along the Riva di Biasio, skirting the Grand Canal to the north, even though his house and shop there were razed after the butcher was drawn and quartered and left to rot on the Ponte dei Squartai (the bridge of quartered men) on nearby Rio del Tolentini. It was commonly believed that a 16th-century relief of St John the Baptist's head on a platter, on the wall of San Zan Degolà, is carved with his features.